INDIANAPOLIS (Jan. 11, 2012) – Andretti Autosport announced today it has signed Canadian James Hinchcliffe to a multi-year IZOD IndyCar Series deal. Hinchcliffe, a young, yet accomplished racer, steps into a big role as driver of the GoDaddy.com Chevrolet for 2012. In his first year in the IZOD IndyCar Series, Hinchcliffe took three top-five and seven top-10 finishes to earn the series’ Rookie of the Year title despite missing the season-opener in St. Petersburg, Fla. Hinchcliffe, a 25-year-old from Toronto with both British and Canadian lineage, finished fourth at the 2011 Long Beach, New Hampshire and Kentucky races. The well-spoken television and Internet personality makes a great match for Go Daddy, the world’s largest Web hosting provider¹ and legendary television advertiser. Hinchcliffe is a skilled driver who has been honored numerous times for his on-track achievements in open-wheel racing. Hinchcliffe was recently a nominee for the 2011 Autosport Rookie of the Year award in England and won the prestigious Greg Moore Legacy Award in 2010 for his efforts in the Firestone Indy Lights. Hinchcliffe becomes the second driver on the Andretti Autosport roster to have won the Greg Moore Legacy Award, joining 2004 winner and new teammate Ryan Hunter-Reay. Hinchcliffe’s path to IndyCar began with two seasons in Firestone Indy Lights. In 2009, he secured five podium finishes, six top-five and 10 top-10 finishes, including a second place finish at Mid-Ohio. 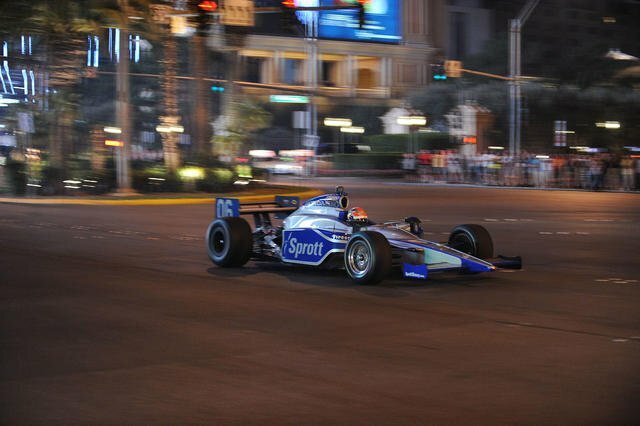 The following year he impressed the paddock with three wins, 10 top-five finishes and a series-best four pole positions, ultimately finishing second in the 2010 Firestone Indy Lights championship. Hinchcliffe began his racing career in karting and captured numerous titles such as the TKC Junior Rotax Class Karting Championship, the Junior Rotax Canada Cup and TKC Winter Series Championship. After earning several more regional and national karting series and championships throughout the United States and Canada, Hinchcliffe moved on to successfully compete in the Bridgestone Racing Academy F2000 series, Formula BMW, Star Mazda series, Atlantic Championship and A1 Grand Prix series. Go Daddy, the world’s largest provider of Web hosting, domain name registrations andnet new SSL Certificates, also sponsors Mario, Michael and Marco Andretti as part of a three-generation spokesperson campaign designed to showcase Go Daddy products and services. To learn how to easily and affordably build an online presence, visit www.GoDaddy.com. For more information, please visit www.AndrettiAutosport.com.